1 day: I cut at first the burning papers one by one from a sheet of blotting paper. 2 day: I age by hand each burning paper with a natural salt solution. 3 day: I apply with a brush the 1 coat of the mixture of resins on each burning paper. 4 day: I apply with a brush the 2 coat of the mixture of resins on each burning paper. 5 day: I apply with a brush the 3 coat of the mixture of resins on each burning paper. 6 day: I apply with a brush the 4 coat of the mixture of resins on each burning paper. 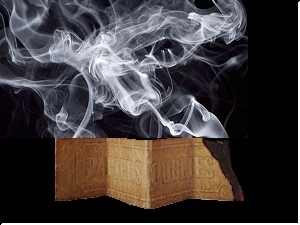 7 day: I emboss each burning paper with a dry stamp of the mark ® Papiers Oubliés ®. 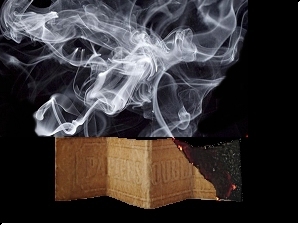 I deliver on request the burning papers 8 cms x 2.1 cms ® Papiers Oubliés ® in a certificate of authenticity: it is a sheet A4 of laid brown kraft paper that I fold in different envelope shapes for the assortments and the selections. I sign and date the certificate by adding Your Name, then I hand emboss it with two dry stamps. Finally I put a black ink stamp with the graphic symbol of the mark ® Papiers Oubliés ® on the back of the assortments. 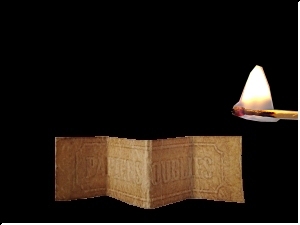 Advice of use: take or cut a burning paper ® Papiers Oubliés ® and fold it in accordion on a saucer. Light an end without firing it and let it waste away by crackling while the smoke cleans up the room. Because of the power of only one burning paper ® Papiers Oubliés ®, stay away while the smoke scatters, or cut it in 5 in the length direction, then aerate the room and only the subtle perfumes of millenniums incense will remain. The origin of the word perfume comes from the Latin per fumum, through the smoke: it is therefore the smoke of the incense resins that were the first perfumes of humanity. The burning ® Papiers Oubliés ® from the ® Grenier Impérial ® are unique creations designed with natural elements.